Transgender and gender-nonconforming people have historically experienced discrimination, harassment and violence at far higher rates than other people because of their gender identities and gender expression. After decades of advocacy, the legal landscape is finally starting to recognize transgender and gender-nonconforming people as a class that deserves protection under the law. 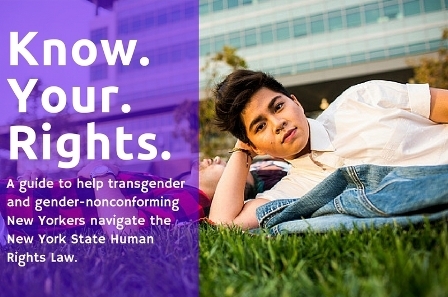 The Know Your Rights guide explains how the New York State Human Rights Law (HRL), specifically, protects transgender and gender-nonconforming people. It describes what unlawful discrimination looks like, and what you can do if it happens to you. This guide also contains some information about your legal rights under other state and federal laws, and gives you contact information for legal advocates and attorneys across New York State that may be able to advise you about your rights.